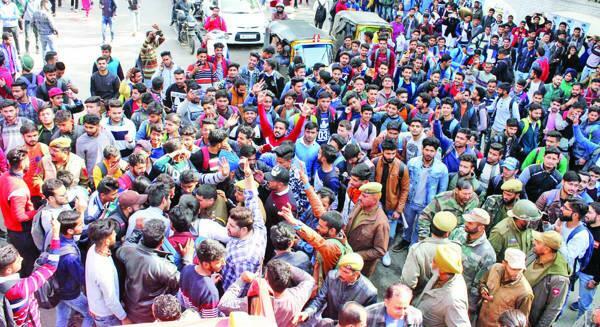 Jammu, Feb 12: Shouting "Bharat Mata Ki Jai" and "Vande Matram", thousands of college students on Tuesday staged protest and demanded arrest of those raised "Pro-Pak" slogans. Pertinent to mention that "Pro-Pak" slogans were allegedly raised on Monday by a section of Kashmir bound stranded passengers who were accommodated in a hostel located adjoining GGM Science College. On hearing slogans, College students raised objections and protested followed by a march and clashes broke out between them and stranded passengers. However, this morning students of GGM Science College staged protest and took out march and blocked the Canal Road. Agitating students shouted anti-Pakistan slogans and demanded action against those who raised "Pro-Pak" slogans and the police personnel who thrashed them when they were raising "Bharat Mata Ki Jai". "We will not tolerate this in peaceful Jammu," students said, adding that if the administration fails to take action against those officers who could not digest national slogans and beat nationalist forces, students will be forced to intensify agitation. They demanded their suspension and also stern action against students as well as those living in hostel, who were among stranded passengers and raised "Pro-Pak" slogans. The students boycott their classes and have given 24-hour ultimatum to the police and administration, otherwise they will intensify the agitation.